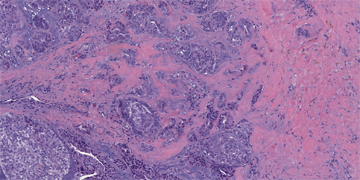 The patient is an 82 year old woman who presents with a 2 cm bulging left soft palate mass, just posterior to the junction of the hard and soft palate. 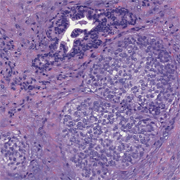 Sections show an unencapsulated, infiltrative tumor with low grade vesicular nuclei showing a variety of growth patterns: solid, tubular, single cell filing, microcystic, and papillary. 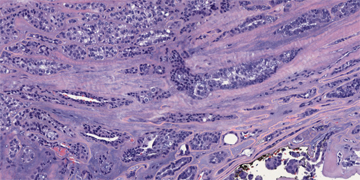 Scattered foci of gray-blue chondromyxoid stoma and numerous psammoma bodies are present. 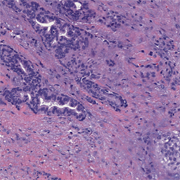 The features are characteristic of polymorphous low-grade adenocarcinoma (PLGA), a malignant neoplasm primarily arising from the minor salivary glands with 60%-70% involving the junction of the hard and soft palate. 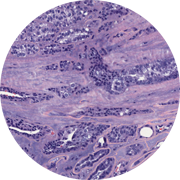 PLGA is characterized by minimal nuclear pleomorphism, a variety of growth patterns, and low metastatic potential. Complete surgical excision is standard therapy.